Kapcon registration has gone live, so I will do another post on progress with the Colossus of Atlantis meagagme soon. In the meantime, here are my musings on running a SF campaign next year, based on an email I sent out to my current play group. posthuman/transhuman elements are worth a look. I was recommended to watch Dark Matter (party wakes up on a spaceship with no memories, the ship has a cargo of weapons and some locked doors) and the Expanse (for a greater dose of realism in space). My recommended reading to my players was Altered Carbon (FTL is only possible via uploaded minds, central protagonist is an Envoy, a type of troubleshooter trained to use whatever tools are available to solve problems). Other media recommendations are most welcome. The title of the post is from a line in Mary Shelley’s Frankenstein. My current go to place for insight on spaceships and SF tropes is the Atomic Rockets website. Past feedback was that some of my players would prefer not to use a D100 system in the next campaign (so that rules out Eclipse Phase, River of Heaven, Revolution D100 or M-Space). One issue identified was never actually feeling like your characters were competent, or not being able to judge your relative competency against opponents, which was really brought home by watching how an 80% Endurance skill meant next to nothing if the blow taking you down was a critical hit (you had to both roll a critical yourself, and have it exceed your foe’s roll, so that 80% baseline skill might only end up with a 3% chance of success). I have also found a few elements of the RQ6/Mythras system to be fiddly (adjusting skill chance by dividing/multiplying skill level, a lot of die rolls lead to boring outcomes, and choosing combat effects after the skill roll is made is an immersion crushing waste of time). I do have some ideas to retool D100, but that would take some work. The problem with nearly every SF game that tries to handle transhumanism, is that there is lots of paperwork when shifting bodies, and its pointless to spend character generation resources on physical attributes, when you can buy better in-game. As such I don’t think any first generation lineage game engine can cut it. Eclipse Phase is weirdly over complicated for what it tries to do. Zak Sabbath had a simpler OSR take on this issue. I lean towards something more descriptive, like Cortex+ or Fate, but that means buying into the abstractness of plot point meta currency systems, and being in tune with not trying to track every last plasma round and credit chip. The alternative is to drop the mind uploading/body hopping aspects of transhumanism. If I did that, then I might build the combat engine around fighting to the point where the PCs combat armour is knocked out, rather than fighting to the point where carbonised brains splatter the bulkheads. At which point why not go full Mecha? None of the Apocalypse World hacks for SF look like a finished product to me. Corvus Belli Infinity (a 2d20 roll under Target Number game , so I have some familiarity with that from Conan, and its going to be used for the John Carter of Mars game as well). I am not fond of the level of detail and 3d6 systems used in GURPS/HERO systems. After playing Dragon Age and D20, I am not fond of hit point bloat systems, so while I could retool Fantasy Age into “Space Age”, that would take some work. I don’t see any ports of 13th Age into an SF setting yet either. Do you have a system recommendation, or preference for one of the above game systems? FTL: entry into FTL space is easy, the hard part is getting out again – you need to home in on a beacon signal or specific type of variable star signature, before the heat build up inside your ship kills you. The characters are specialists in dealing with colony worlds where the beacons go dark, so they have a good ship and a job that gets them into trouble. They also have a license that keeps all of their high tech equipment functional, but if they go dark themselves, then it all stops working four weeks later when it realises it has not received the latest security update. Humanity’s final fate (these days its likely to be some kind of singularity ascendance, in the old days it was white togas and flared shoulders for everybody). The key insight here, is that most visions of the future recycle the past. Not every SF work follows this pattern. In Andre Norton’s “Star Guard“, humans are only allowed off Earth to act as mercenaries for other aliens, and this occurs in quite a few other series, such as Jerry Purnelle’s “Janissaries” books. In The Course of Empire, by Eric Flint and K. D. Wentworth, humans are sepoy soldiers for aliens who have conquered Earth. Which is getting closer to what I want for a setting I think. The Great Big Space War – humans have a choice, help their alien overlords, passive resistance, or active rebellion. In terms of how it relates to PCs, its the value/loyalty choice in step seven. At any other point of the cycle prior to that, the smart money is on the aliens. I am thinking that a lifepath character generation system makes some sense, if it gets player engagement with the setting. Traveller used to have as a feature death in character generation. In a Transhuman setting, you could have a conflict that causes players to roll 1d10 to see how many times their character was KIA and restored from backup. I did a search for Cold War rpgs a while back, and found a few – most of which had an occult focus with the Cthulhu Mythos or similar. I suspect its harder to do the betrayal theme in a long running campaign with the 4-6 players you usually have in a tabletop campaign. If a Firefly game can be summarised as “get a job, stay flying”, then an espionage focused Cold Stars game could be described as “find a secret, stay alive”. Being old enough to remember watching the Berlin Wall come down, just in time for my end of year Political Science exam on the Cold War, I can remember the fear of nuclear war. Its abated today, and shifted to the rogue state. So in an rpg reflecting modern fears, its not so much the alien invasion, its the one shot dinosaur killer strike from a splinter faction or rogue captain with a ship and an FTL drive (which is the key problem with reactionless drives, every merchant captain controls a world killer). A thought a had a while back, to represent this tension, is to just ask the players if the world ends in fire at the end of every game session., if any of the players says ‘yes”, then the campaign is over. Time to move on to a post-apocalyptic game? One reason to have aliens in the setting is to create an “upper class” that human characters can never truly be part of. I have a couple of different ideas for implementing this mechanically in the game. One is to have the players roll dice to see which one of them has a privileged background. That character starts with property and cash. All the other characters start in debt. Another is to invert the benefit table from Traveller, with each term of service prior to start of play leading your character ever deeper into debt. The future of warfare is likely to involve human-machine teams, where the sharp end of conflict is conducted at machine speeds. Human decisions remain important for starting and ending conflicts, and for resolving complex situations not anticipated by software. In space warfare, I simply don’t see any reason why humans would be climbing into turrets to shoot at piloted fighter craft in line-of-sight ranges. Machines will do that job better than we can. The important human decision is around hiding, running away, starting the fight, or trying to surrender before the ship explodes. In other fields, I think close quarters urban fighting is likely to remain a human skill set, but everyone will be using drones to make their perception checks, and calling in precise-strikes from networked assets. One idea I had for implementing automation in combat is to make the PCs make a survival check in each round of combat. The PC with the worst roll takes one point of damage per combat round, e.g. in round three they take three points of damage. If you can’t win quickly and break the enemy’s lock on your location, you need to run before the rest of the drone swarm turns up. At any rate, I think SF games need to move beyond replicating World War II or Vietnam in space. I had this idea of disposable spaceships. Order it, a 3-D printer makes it, its engines are good for a few jumps, then you recycle it when you dock because that is cheaper than paying the docking fees for three days. Amusing, but I suspect players prefer a more permanent home. It would be a universe where you only own what you choose to carry. Escalated to a mass scale, it gets you lots of small starter colonies that no longer have functioning spaceships, and are always interested in imports of up to date printing templates and OEM printer gunk. This flows from automation, the current trends in copyright and licensing, and social inequality (I donate money to EFF.org to try and stop this from happening). While there will always be work for humans, the amount of work that will propel people into the property owning class will diminish. Everyone else will end up using major items on a time share basis, with no true ownership. character values – passions, drives, triggers. I asked my players what they preferred to do in games. For the most part my campaigns have been old school (there have been dungeons, monsters and loot) with the addition of lots of social action with NPCs and grey morality – hopefully giving the players meaningful choices about who their friends and enemies are, and whether they are heroes or “the baddies”. I am still thinking a lot about what the core character activities in a Cold War in Space game should be. A few one paragraph reviews of various roleplaying game PDFs I have been reading over the last few months. “Being a collection of maps & adventures set under the earth”. 153 pages. $9.99 from Drivethrurpg.com. Old school fantasy dungeon crawl maps. The first half are keyed with generic encounters, the second half are just the maps. One 11 level dungeon, and another 49 individual location maps (tombs, mines, bridges, throne rooms, monasteries, etc.). I have found it useful for off the cuff dungeons and planned encounters. 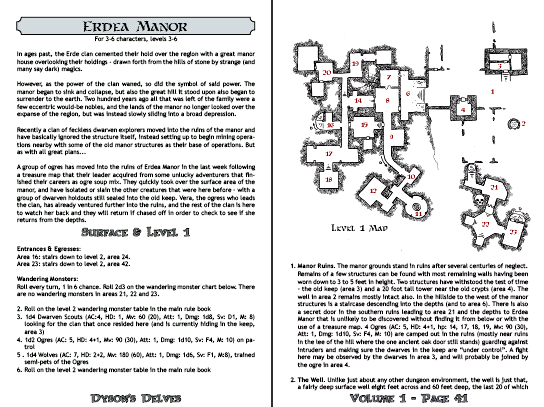 There are quite a few people making a few coins by publishing old school dungeon crawl maps. “Being a treatise regarding Magics, Sorceries, and Dark Arts for Fantasy RPGs”. 161 pages. $9.99 from Drivethrurpg.com. Old school renaissance (OSR) with 13 magic using classes, some familiar looking spell lists from Labyrinth Lord, 28 pages of magic items, and a few monsters. I found the section on magic items useful, lots of good ideas to borrow for my tabletop games (I now try to always have a 1d100 chart of wondrous junk and treasure for the players to encounter while shopping). A roleplaying game of cinematic Lovecraftian SF. 196 pages. $14.95 from Drivethrurpg.com. 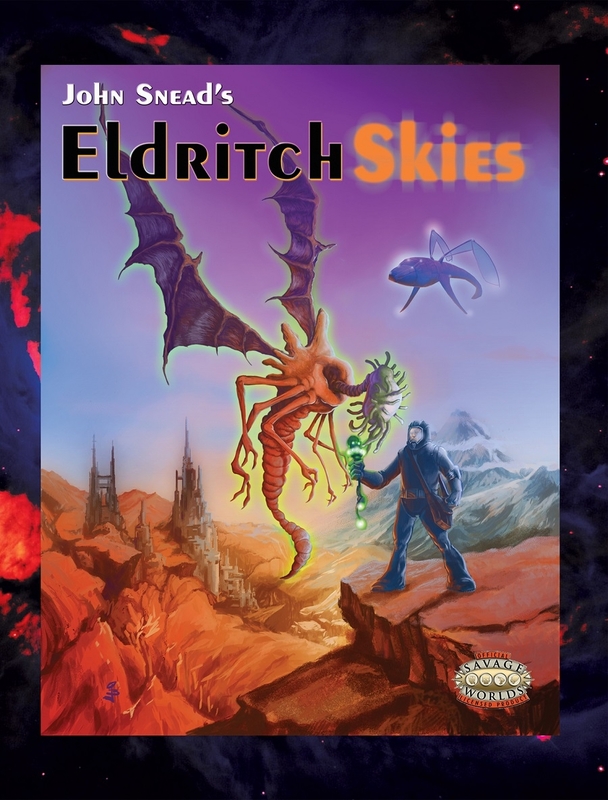 Eldritch Skies extrapolates from the Lovecraft canon into a future where human governments make deals with aliens and start exploring the depths of space in the post-revelation era. 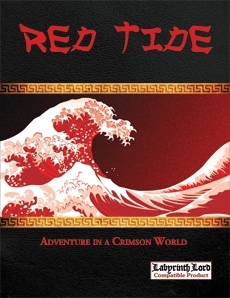 Its a pulp game, much more optimistic and hopeful in tone than classic Call of Cthulhu. PCs are likely to work for the UN agency OPS, trying to protect the remaining secrets of the Great Old Ones, and to prevent aliens from harming humanity/earth. I’m not really familiar enough with Savage Worlds to judge the adjustments it makes to the system, but PC generation and play looks straightforward. Bonus points for allowing PCs to be Deep Ones or Half-Ghouls. Rather than Sanity, you have a rating for exposure to hyperspace. From a design point of view, I found the notes on the fate of alien species (ascension into hyperspace, extinction due to carelessness, or cautious stasis) to be useful for any setting where you might want to think about the implications of Drake’s Equation. 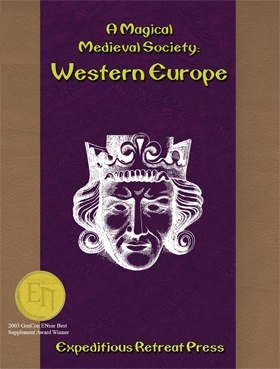 This book aids the creation of a generic Western European medieval world consistent with D&D (3rd edition). 194 pages. $14.40 from Drivethrurpg.com. Its history plus Fireballs, Resurrections, and magic swords/wands. I think it succeeds in adding a touch of realism, but for me its almost a valiant failure, because D&D magic would be so subversive of what happened historically – Castles and Knights just don’t make as much sense in a world with flight, invisibility, etc. So for me, the real value is just the plain historical guff on crop rotation, manorial tithes, etc. 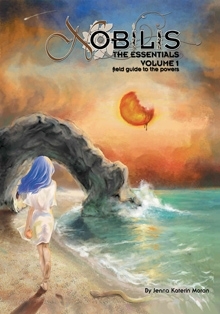 This book updates and reprints the Amber diceless roleplaying system with a new setting. $19.99 from Drivethrurpg.com. I am not sold on the diceless system – on the one hand it pushes for a character ranked first in an attribute to always win contests with that attribute, elsewhere its clear that other characters can negotiate, argue, twist to another attribute, etc to win – despite not being first rank. It did, however, make me interested in exploring rules for campaign settings where the players design all the PC races (because really, why should the GM decide Our Space Elves Are Different? ), and then also design the enemy races (spend lots of points to build the big bads/masterminds, spend no points and create a race of pitiful mooks). The Grand Stair, and its infinite doors linking all the worlds together is a solid idea for any campaign setting. The Dwimmerlaik were also an interesting great enemy race. Another OSR product. 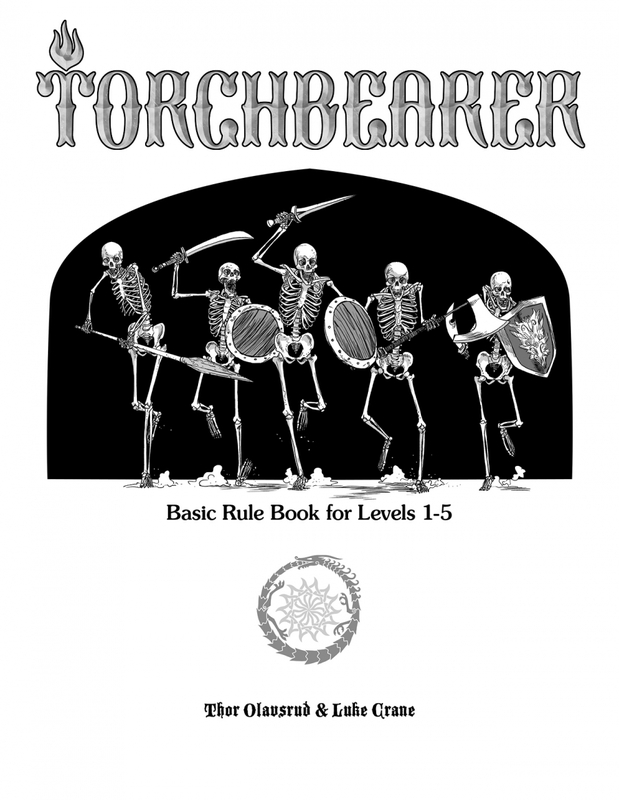 $7.99 from Drivethrurpg.com. The language of OSR systems is familiar to me from the D&D games of my youth, so its easy for me to ignore it and focus on the cool ideas in the setting. TLDR Red mist drives people crazy/mutates them, people flee on boats to an island crawling with Orcs, which the mist does not extend to. Flavour is oriental, with demon worshiping Samurai, and Chinese cultural elements. The Orcs are not just mindless savages, and their background gives them a lot more depth than they usually get in D&D. Favourite bit though was the Dwarves, the reason they accumulate gold, is because its essential for forging spirit weapons/armour used in the afterlife to fight a vengeful Goddess the Dwarves have rebelled against. This is a wonderful homage to the dungeoncrawls of yesteryere, with modern mechanics to improve story telling (based on Mouse Guard). $15.00 from Drivethru.rpg.com. A key focus of the game is on rigid accounting for time and inventory. Torches, rations and other supplies are all carefully tracked. If you don’t have room in the sacks, you cannot take the loot with you. The black and white artwork really reminded me strongly for the Fiend Folio and the Steve Jackson Fighting Fantasy books. An interesting tough, is that one way of increasing your XP, is to increase your chance of failure on an important dice check. This is a Nobilis spin-off, some kind of pastoral kids growing up story telling theme. Not my kind of thing. I stopped reading after about twenty minutes. YMMV. A lot more comprehensible to me than Chuubo’s, but still a struggle for me to read and complete. 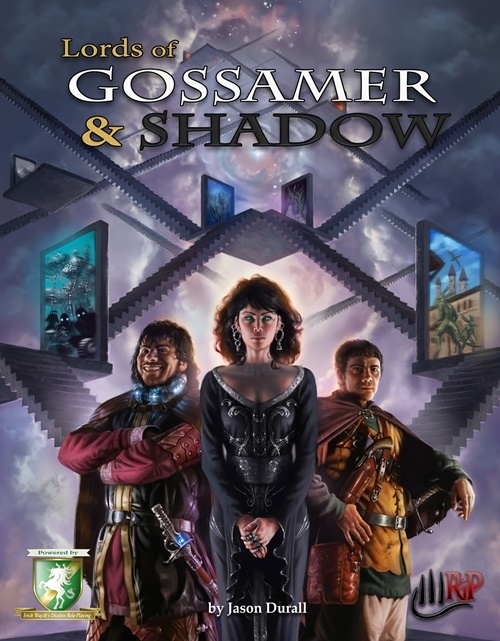 $19.95 from Drivethrurpg.com. The accompanying side bar text is very evocative, some of the best I have ever seen. The illustrations were a lot more perky than usual for roleplaying games, even when handling some difficult topics. The background world concept, Estates (your role as a fundamental expression and guardian of the universe) and Domains (home bases), was also quite nice. Mechanics are very text based, even though there are some numbers in there, its a conversation resolution system, not a dice fest. I think I would struggle to run a game with this, unless all the players had spent a lot of time with the rules beforehand. A retro sci-fi future past. $19.99 from Drivethrurpg.com. 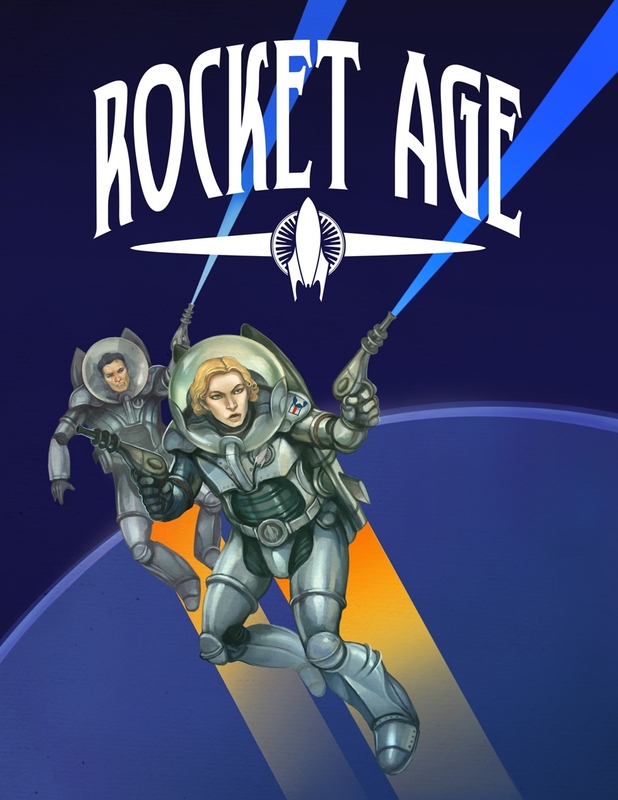 Its ray guns and Flash Gordon rockets within the Solar System, with a 1930s setting. So the Great Powers are being colonial bullies on Mars, and the Germans are developing war technology to conquer the solar system with. The artwork is solidly in that retro art deco style, which I like. Lots of alien species. Its take on a Barsoomian style Mars is quite engaging, and I like it more than the Space: 1889 take on red Mars and its canal civilisations, but there is plenty of room elsewhere in the system for different flavours of adventure. Main mechanic is 2d6 + Attribute + Skill +/- modifiers compared to difficulty setting.